I knew I was going to review this book so in preparation I kept away from all of McGonigal’s talks, interviews, and presentations as much as possible before reading it. I caught her appearance on the Colbert Report, but it was hard to make any prejudgments from that short interview. So I am coming into this review as clean as I possibly could and allowing McGonigal’s book to speak for itself. Having read it, I asked on twitter, rhetorically, how do you review this book. It’s a book about ideas and about theoretical space of a possible sociological future. How can I criticize the book without criticizing* the ideas within? Answer: I can’t. I can’t solely focus on how it’s presented or the coherence of the argument. That would be denying a fundamental aspect of the book. That’s a good starting position. Jane McGonigal is an enormously charismatic woman. Even in her writing you can feel the exuberant energy of her personality coming through loud and clear. She is a persuasive woman and you can’t help but be swept along by her ideas and optimism. She also has gathered a dedicated following. It’s not surprising. In the mainstream media video games are always about the negative press and the demonizing of the medium. Then comes a charming, charismatic, enthusiastic, professional woman saying ‘no that’s wrong, it’s the exact opposite.’ It’s easy to see how she gathered a following. But thankfully there is more. She is intelligent and knows her stuff. At no point does she feel like she’s bullshitting you. The book is really three books in one. It isn’t scatterbrained in its delivery, no it presents a series of quite coherent arguments with one point fully explained and explored before having the next chapter build off of it to make the nest point. The book is divided into three sections that follow the shift in focus. Part one entitled “Why Games Make Us Happy” is self-explanatory. It is also the best part of the whole. Those first hundred pages where she explains all the research and effects paying games has on the human psyche is fascinating. To see how our minds work and how the mass introduction of electronic games has shifted our generation’s perceptions of reality is a masterwork of argumentative writing. She never writes down to her audiences, but does expect you to keep up. She uses simple and clear language to get across these complex ideas, slowing down to explain a piece of gamer jargon to the masses. It contends that reality was always dull, but now with the well-tuned comparisons to fictional realms we see this disparity greater than ever before. Here we see Mrs. McGonigal lays the groundwork for her later assertions, but I heartily recommend this part of the book. Part two is where she focuses on where we are now. Most of her writing looks not at present day video gaming, but ARGs (Alternate Reality Games). I knew very little about them and you can see their usefulness in certain aspects. She introduces the concept and familiarizes you with what they are while at the same time extolling their usefulness. Chore Wars is an interesting concept that is defiantly beneficial if you can pull it off in your house. SuperBetter is another game that seems like a pure beneficial game in the area of health. In fact all of the examples she gives are wonderful sounding games that make the world a slightly better place or at least make us better in it. And yet while I was reading it I felt there was something wrong. It was the same feeling I got when I was two and my dad teased me by acting all surprised when plugging a power strip into itself wasn’t working. At the time I didn’t know what, but I knew something was wrong. Several times something would come up that made me think that here is where her argument breaks down, but then further on my questions would be answered. For instance, at the beginning of chapter 10 she starts off with a few examples of activities that better our self-esteem. That sentence made me stop reading for a while. It actually made my mind go blank. Eventually I was able to muster a thought and it was, “That is going to go horribly wrong.” I even started constructing my argument on the various problems with that activity. But as I read on the game it was apart of made more sense than that sentence by itself. My fear of the activity were countered by how the game worked and the problematic situations wouldn’t come up. Another issue I thought was all these games seems only to work with first-world issues. There is nothing wrong with that, but McGonigal was contending that games would change the world for the better. Nothing I was reading would solve Darfur or hunger in Africa. All the crowd sourcing and positive thinking wouldn’t help those desperate people in need, but then I got to part three. In part three the focus shifts to the future or rather the matter of scale. All the games she had looked at previously were rather personal or at least confined affairs. Now we are starting to explore the games of a global scale. As for hunger in Africa, the game Free Rice is an answer. A game solving a real world issue 10 grains of rice at a time. The further she pushes forward it is difficult not to follow her lead. Even when she gets into explaining the most esoteric and most complexly mental ARGs you can’t help but figure how these game systems could better the world. However, something doesn’t ring right. Even as my minor quibbles are one by one shot down through her rhetoric I still couldn’t shake the feeling something was off. Her facts add up, her conclusions are step by step and logically sound. Then one of problems hit me. Her entire book is overwhelmingly positive. I knew this going in and doing my best not to be a curmudgeon, but the book really is looking too much on the greener side of things. She glosses over or outright ignores many of the darker aspects of gamer/internet culture. One of the greatest crowd sourcing accomplishments is Wikipedia, which she talks about at length, but another is Anonymous. Even ignoring them, Wikipedia is not the great project millions pour hours into solely to make great. There are a large number of people who will change things purposefully to be wrong or politicians who will abuse their personal page and insert things they haven’t done. She glosses over this by framing it as an argument of differences in how to present the facts. Yes there is that too, but it ignores a big problem that Wikipedia has been dealing with from the beginning. In fact throughout the whole book “griefing” is mentioned once and only in passing. The concept of people who enjoying throwing the game off balance or harming the experience for others is ignored. Trash talk is covered when talking about a facebook game people play with their moms and equated to light teasing.Â The first thing I think of with regards to gamer trash talking are the racial and homophobic epithets streaming from a 14 year olds mouth to my ear over Xbox Live. Trolling is treated like it doesn’t even exist. Gamification is never mentioned by name, but at the same time that is what is being advocated on some level, but only in a certain application as if corporations or governments wouldn’t use it to modify other behaviors that may or may not be beneficial. McDonald’s wants you to buy more fries and could easily make a game out of it. It’s not healthy for you. She talks hopefully of a peaceful day where North Korea can successfully connected to the rest of the world freely and I can only think of their leadership learning to use these same techniques for the opposite effect. I can understand not wanting to focus on it, but pretending it does not exist is just naive. That’s what was getting to me the whole time. McGonigal is an idealist, but to a fault. She so much wants to focus on the positive that the further the book goes along that path the harder it is to follow. This is where I finally saw the real problem with the whole argument. Ignoring the ugly side of gamerdom was only a symptom of the greater issue. It was bothering me from the beginning and it was only after finishing the book could I see the whole picture to realize where it breaks apart. She disregards the positive value of the “escapist entertainment” of video games at the very beginning. To her credit she doesn’t say we shouldn’t have them, but it would be a shame if that is all games amounted to. Video games are a burgeoning art form and art can have a profound individual effect of a person. McGonigal seems to disregard what a sublime work can do to a person and instead looks at the formula that allows them to be so effective at the ‘inconsequential’ and transplants them to the macro. She starts at the smallest and most individual level in the beginning of the book and then works her way up to a global scale. However, as we move up the sense of scale we lose the effect on the individual. She mentions activities from World Without Oil like fostering a community, potlucks to help with food shortage, self-sufficiency with gardens etc. But those are mere parts of the larger-hypothetical-system to surviving the hypothetical global oil shortage. The macro system is like the god games Civilization and SimCity that McGonigal uses for comparison and like those games you cannot control the individuals. The Sims have the exact opposite problem, you can control the micro (the small community of sims), but cannot see the macro (the larger world that continues on past the borders of the map). Superstuct was an impressive piece of hypothetical work, but again its focus is on the macro systems that has little parlance with the micro and at the same time any focus on the micro would lose the global structure set forth by the macro. This disparity seems like an oversight or a challenge to overcome or something else. I don’t know. It’s never addressed. The game is about the role of super structures changing the world, but where are the game elements for each and every individual that would have to participate to effect them. Plus, McGonigal is trying to replace one system of thought with another via a full-scale implementation of gamification, but it doesn’t work like that. Recent evidence from Egypt, Tunisia, Jordan, Yemen, Libya, etc would say it is the other way around. It is multiple micro elements that culminates in, without any super structure, a macro movement. The biggest issue in solving a problem is not how to do it, but knowing it’s there in the first place. We have a society that has no knowledge of these problem’s existence or and sophisticated understanding of them. Education and enlightenment seem like a better use of these engagement systems. Pushing towards a greater good utilizing the systems of MMO is one thing, but knowing what you are doing and why in the end seems like a better purpose, even if it doesn’t transcend to a global scale. 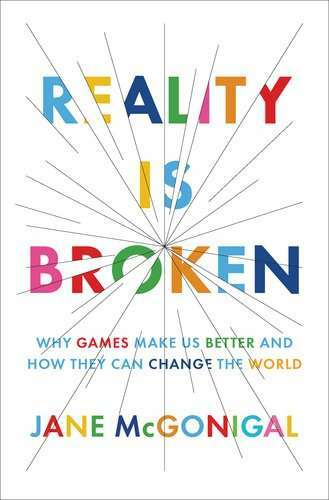 McGonigal’s book is an interesting read and given with the great push from all sides towards gamification probably a necessary one if only to see the best of all possible outcomes even if the argument is incomplete. But without the counterpoint, without solutions on how to deal with the problems such systems could potentially create themselves Reality is Broken is incomplete. And incomplete thoughts for good are more dangerous than complete thoughts for evil. *Criticize despite what most people think, as a negative term is a neutral term. You can have positive criticism and negative criticism. 2 Responses to "Reality is Broken – A Book Review"
Yes! This, right here, is the best review of her book I’ve read. Though, I do wonder if involving the negative would completely derail the book, with just how overwhelming it can be to consider all of the nastyness we inflict upon each other and the world. It seems to me that whatever handhold the book makes would crumble under all that. Great review! It is refreshing to read such an unbiased review. I still plan on reading McGonigal’s book, but I will surely keep in mind the counterpoint that is not addressed. Thanks again for this unbiased review!